Myriad, alongside our partners in publishing, New Internationalist, will be showcasing an array of graphic novels at table 177 in the ComiXology marquee at the ever-expanding, exhilarating comic and graphic novel convention, Thought Bubble 2018. Thought Bubble celebrates not only comics but the people who make them; the work and creators who inspire our cultural landscape. This concentration on comics themselves makes Thought Bubble a unique kind of festival and especially loved by comic creators, leading to a consistently high calibre of talent at this annual convention. The convention will be taking place in a specially constructed festival village, which will be located at venues in the heart of Leeds City Centre. The convention consists of four exhibition spaces playing host to creators, retailers and guests, and secondary venues holding special talks, workshops and screenings. 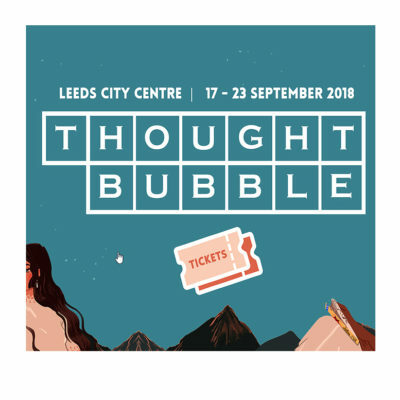 Thought Bubble will last two days, running on 22nd and 23rd of September with over 400 exhibitor tables spread across four exhibition spaces. A full listing of each event will be released soon, and tickets can be bought now via the Thought Bubble website.